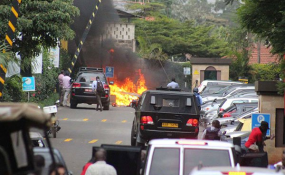 Nineteen people are still unaccounted for more than 24 hours after Kenyan forces ended Dusit siege that claimed 21 lives. In an update, the Kenya Red Cross (KRC) said it received 94 missing cases and had managed to resolve 75 of them by 8:30pm Wednesday. The relief agency said 341 people had undergone counselling services, including on their toll-free line 1199. "More people continue to receive counselling, services that will continue to be available in the coming days at Chiromo mortuary," said KRC communication team. As the injured continue to receive treatment in various hospitals, the agency has appealed to the public to donate blood. "Members of the public are encouraged to visit the nearest regional blood transfusion centres and donate blood," Red Cross said in a statement. The Inspector General Joseph Boinnet on Wednesday evening in his briefing gave the nationalities of the 21 who died in the attack as six Kenyans, one Briton, one American and three victims of African descent whose nationalities were yet to be determined. An Australian man who was on his first trip to Kenya to visit his university girlfriend was also among the dead. Mr Boinnet said two suspects have been arrested in connection to the attack. "They are in police custody and we have a reason to believe that they facilitated the attack. They are assisting the police with investigations," Mr Boinnet said.